I kicked out of the start gate on a sunny, beautiful day in Vail, Colorado, in my jeans and a Hawaiian shirt for the last run of my ski racing career. As I was maneuvering my way through the slalom course, I was still thinking about my tactics and technique top to bottom. Funny enough, I remember it being a pretty decent run considering I traded in my speed suit for that silly outfit so I could match two of my teammates/best friends who were also competing in their last race ever. I came down the final pitch and heard the crowd cheering: friends, family, old teammates, competitors, coaches, everyone. As I approached the finish line, my nose started to tingle; that feeling you get when you know the tears are coming. Sliding into the finish choral, I couldn’t hold back the tears. They were like waterfalls pouring from my eyes, tears stemming from a combination of happiness and sadness. I was greeted with a champagne shower from my fellow Lobos (University of New Mexico Ski Team members), parents, and friends. They cheered and congratulated me on a wonderful career, told me how proud of me they were, how much they were going to miss me racing with them, and how wonderful it was to be my teammates. Gasping for air while still recovering from my run and trying to manage the tears, I smiled, hugged them back, and celebrated this end to an era. No more alpine ski racing for me. I ended my career on one of the best seasons of my life, though I think no matter what I was always wanting more; always seeking new and higher goals. At the same time, I certainly felt ready to be done. Having participated in the cruel yet rewarding sport for almost twenty years, I was emotionally, physically, and mentally exhausted. Even though I felt ready to be done, the actual realization that my ski racing career was over hit me in waves. These waves came and went, some occurred days later, some weeks later, and some even months later. A couple of days after my final race, I started to think about all the things I didn’t do in my career as opposed to all the things I did do. I never got my points (an international ranking system for skiers) where I wanted to, there were certain races I never qualified for or raced at, I was never on the poster for the University of New Mexico Ski Team. I started to think, “if only I had one more year…” I completely believed in my abilities to reach many of my goals and that was a very hard part of me being done, knowing those goals could no longer be reached. These thoughts were toxic to me and I battled with them for a while. It was hard for me to be completely happy and content with my career, something I worked so incredibly hard on and sacrificed so much for. There were many goals I did not achieve and it was hard to let that go. I am now currently working as a fulltime alpine ski coach for U16 athletes in Winter Park, Colorado. I love my kids and love what I do, but at times it is harder than I thought it would be to be on the coaching and not racing side of the sport. Occasionally, still being so involved in the sport reminds me of the things I did not accomplish, but it also reminds me of all the aspects of the sport I miss. I miss competing, I miss training, I miss challenging myself on skis, I miss the feeling of a good turn, I miss traveling to incredible places, and I miss my old teammates and the friends I made along the way. However, being a coach has also shown me that there are things I do not miss. I don’t miss the cold toes, tuning my skis, sleeping in the van, my feet constantly hurting, the constant stress of performing well, and the long days of travel. Going back, I want to expand on why I described ski racing as “cruel yet rewarding.” This sport is like no other. In general, outdoor sports can be quite a treat when Mother Nature has no mercy as to what she provides you for that day. Winds up to 50 miles per hour, temps well below 0 degrees F; I think it is safe to say every ski racer has had his or her fair share of frostbite. The physical demands of this sport can cause a lifetime of knee and back problems, and I know my feet will surely never be the same after squeezing them into boots about two sizes too small. I have scars on my thumbs from slipping while sharpening my edges, requiring a couple of stitches here and there. I’ve spent more hours than any normal person should in a sketchy van with no seatbelt on an ice-glazed road with smelly boys (sorry boy Lobos). I have stayed in lodging that would give you nightmares and plenty of bedbugs to take back home with you. Of course, there is also the unforgiving side of ski racing that comes along with the results of the races themselves. One day you can be crushing training and feeling as confident as ever, then the next day at the race it snows 6 inches, you’re starting in the back, and you come down 4 seconds out of the leading time (this is not fast). One tenth of a second can sometimes make your day amazing, or miserable. An unfortunate mistake or crash in one race can mess up your starts for the next race, putting more obstacles in the way of your goals. I know every sport has these unforgiving aspects, but man, do these really take it out of you. Remember though, I said “cruel yet rewarding.” Key word: rewarding. Yes, I can talk about the results being rewarding. The reward of coming down and seeing that you have the winning time, the reward of knowing your result helped your team score points, the reward of arcing the best turn you knew you could on that one gate. But there is also the reward of participating in something unlike anything else. I now have friends from all over the country: Canada, Norway, Sweden, Austria, even Slovenia. I have a second family, my Lobo team, that I had the weirdest, yet most incredible relationship with and will forever. I have traveled to places I never would have without racing: Alaska, Europe, and South America, to say a few. This sport introduced me to my best friend who is now a sister to me. I am part of a community of crazy, weird, thrill-seekers who are also the hardest working people I know; they have my back at all times, just as I have theirs. It turns out, through the downs of the downs, the sport continued to be rewarding all the way through. I know it is okay to be sad about the goals I never achieved with the sport, this is a trait I have adopted because I am a competitor and I always will be. I know just about everyone has felt this way, whether they want to admit it or not. Even the best of the best will look back and think, “I could have broken one more record…” That is because we are athletes and that drive to be the best, to reach our goals, is what got us to the level we achieved. I do not miss the cruel parts of ski racing, and the rewarding parts are something I do not have to miss because I continue to carry them with me. Although I am sure we can all say this about our sport, my life would not be the same without ski racing. For that, I would say I am pretty darn lucky. With that, my desire to compete, train, and set high goals will always be with me. Right now, I am really into mountain biking and off-road triathlons and I am going to the University of Colorado for physical therapy school in June. Aside from this, who knows what else the future holds for me! Ski racing is not everything. It certainly was for about 15 years of my life and don’t get me wrong, if I could go back and do it again I most certainly would, but it is not everything anymore and that is okay. I now carry myself with confidence and happiness because of my time spent doing this sport. I may not be a ski racer anymore, but I can still rip down the hill while having fun doing it and will probably be able to do so for a very, very long time. Taylor attended the University of New Mexico, where she had the opportunity to compete on the Lobos Alpine ski team. 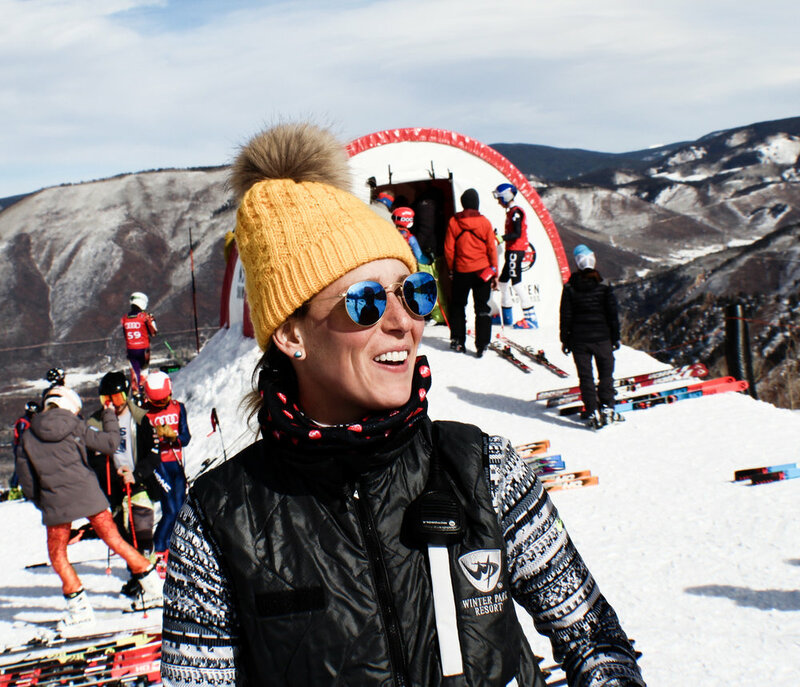 Since graduation Taylor has continued her passion for skiing and is currently an alpine ski coach for U16 athletes in Winter Park, CO. Taylor remains very active and has since picked up mountain biking and off-road triathalons. Taylor will continue schooling at the University of Colorado this June. Please feel free to connect with Taylor.